Car Guy Chronicles’ Mike Matune is trackside for the return of the Gray Ghost at The Monterey Pre-Reunion at Mazda Raceway Laguna Seca. 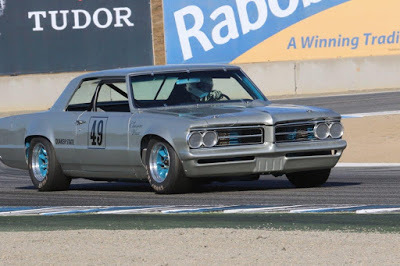 Fans at the annual Pre-Reunion, held a week prior to the Rolex Monterey Motorsports Reunion, were given a real treat with the return to active competition of the Gray Ghost. In 1971 a team of moonlighting Pontiac engineers, including Herb Adams, raced Sandy Adams ‘64 Pontiac Tempest in SCCA’s Trans-Am series. Joining the effort at the Pre-Reunion were Herb Adams, right, and original Trans-Action team member Harry Quackenboss, left. 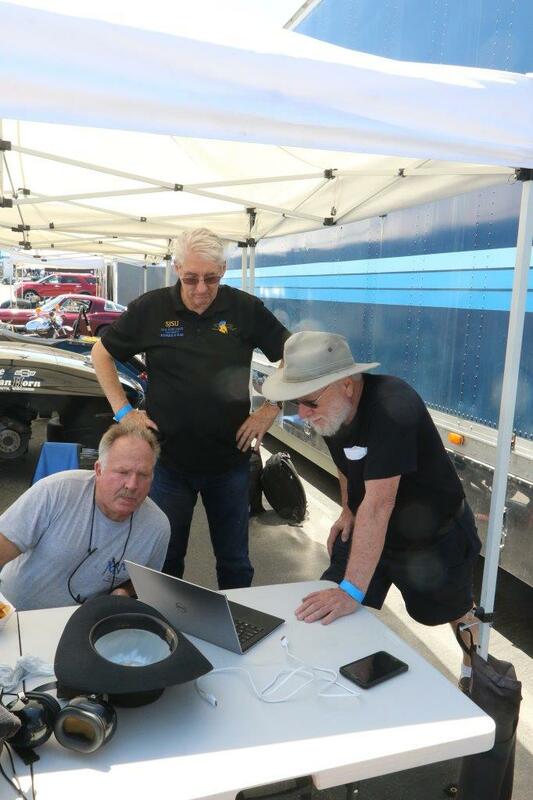 Here they study some photos With Marty Amon of Peterson Motorsports (provided by CGC’s Mike Matune) as they work to set up the car. It’s like the intervening decades never occurred! The car had last turned a wheel in anger more than fifteen years ago. Its return to the track is a result of a herculean effort by owner/driver John Hildebrand, Randy Peterson of Peterson Motorsports in Sonoma and LJ’s Speed & Machine Shop of Napa, CA. Far from an amateur effort, the Tempest Trans-Action team, was a group of very talented engineers and fabricators. With veteran race driver Bob Tullius behind the wheel, they surprised everyone with a brilliant run in the rain in the inaugural event of the season at Lime Rock. 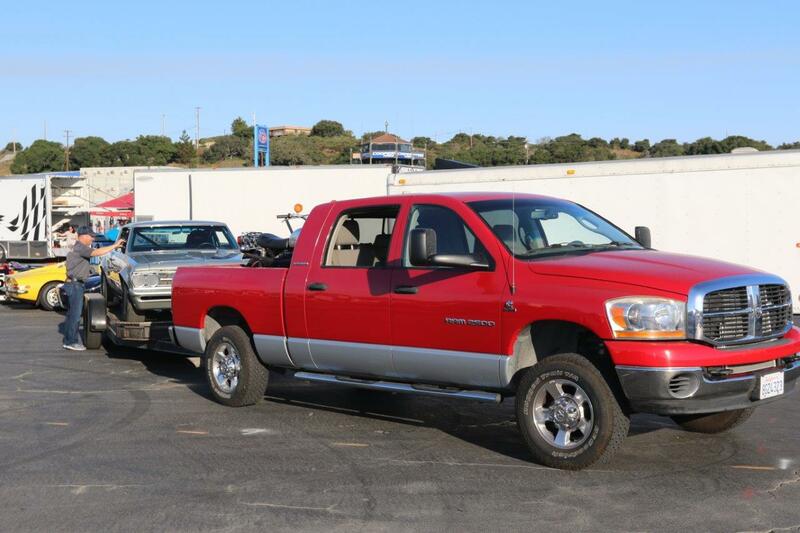 Rumors inaccurately credited the effort to a backdoor GM racing program. 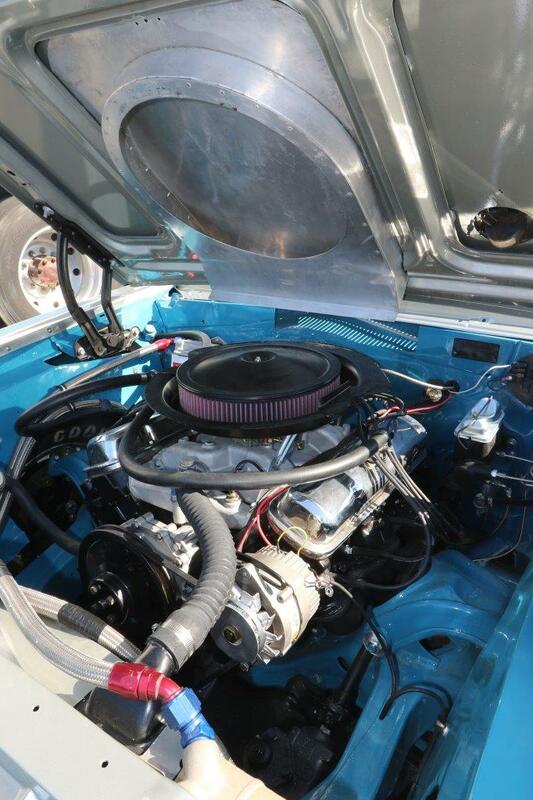 Power comes from a 303-inch Pontiac V8, right, built by LJ, making approximately 450 horsepower. Power goes back through a Muncie four speed to a Pontiac rear. But not just any Pontiac rear-end. This one is modified with flanges in the axle tubes that allow the rear axle to be de-cambered for handling and, makes changing gear ratios easier. 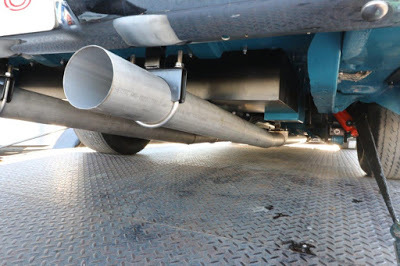 At Monterey, the Gray Ghost was equipped with a unique exhaust system that featuring long “lake pipes” that run from the header collectors, below, under the rear axle to the rear bumper. This system is a replica of one used in-period, designed to give the engine the longest possible collector pipe. 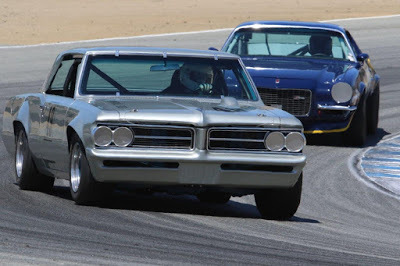 The SCCA took umbrage, alleging competitors’ complaints, and the system returned to a more conventional side exit exhaust. Words & Photos: M.M. “Mike” Matune Jr.